Commentary: Before Attack of the Clones was released, I was enamored with one rumor I heard-- that George Lucas was working in a diner sequence, with some alien short order cook guy. The end result was Dexter Jettster, a lively creation that really didn't get to do a whole lot other than look cool, sound cooler, and act as a constant reminder that extremely interesting people inhabit the Universe outside the focus of the main story. With four arms, ill-fitting pants, and sharp objects, how could this figure possibly disappoint? Well, he's based on an early maquette-- the figure is very close to the movie, but not perfect. It's still very good, and with four jointed arms and all the normal joints, as well as a lot of unique paint applications like tattoos on the hands, it's a gorgeous toy. It's just not 100% perfect to the film. Little details like a filthy apron and a shirt that seems designed for another species give this toy a lot of character, and he'll be right at home with your other figures. Collector's Notes: He was fairly common, and he's somewhat cheap. He was only released once, so other than packaging variants and an unproduced "pipe variant," what you see is pretty much what you get. He's not what you would call loads of fun, and a new version would be nice to see someday-- but the character on film was just so gosh darn likable that it's hard to not want to own this guy. Of course, I'm biased-- I've always been a fan of sci-fi oriented characters who have extremely mundane jobs. (Garak? Yes.) You'll probably have no other shot at a toy of an alien short order cook, so you'd better get this one. Collector's Notes: He might go for a few bucks on eBay, so if you see him for a fair price, odds are you should make a quick decision to buy (or to not buy.) There are no currently known plans for a reissue, and as a short-run figure, it really doesn't seem like Hasbro has a good reason to trot out a new version or a second run of the old one. Were I you, I'd buy it if I saw it-- unless you're reading this in 2011 and a super-articulated version is coming, in which case you should ignore this and just get the new one. Collector's Notes: This figure is also available in the 2006 Saga Collection-companion "Greatest Battles" line in far superior packaging. You may find it in stores now. 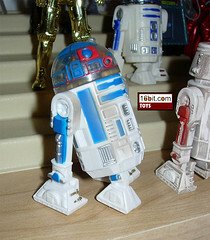 This mold was used in 1998 for the Power FX R2-D2, in 2002 for the only R2-D2 for Episode II, and was retooled in 2004 for Dagobah and the Original Trilogy Collection. The OTC and ROTS versions have the two best sound chips-- the others are basically worth skipping. Collector's Notes: Sure he's short, but he's a figure with enough detail that you won't feel you got ripped off. You can get a Zutton off of eBay for four or five bucks, or in a lot with other figures for under $10 if you're lucky. As there are no known plans to reissue this one, we would give you the blessing to buy one on the secondary market. It really is a nice enough figure that we don't feel you'll be sorry. Collector's Notes: Initially, this set was hard to get to the point where some collectors, yours truly included, haunted Kmarts daily after hearing it might be in circulation-- and during 2005, I saw a grand total of two of this set. It was easier to get in other markets, though, and in 2006 Hasbro and Kmart had a second run of this toy. And not one to waste a good opportunity, Kmart jacked up the price by five bucks. For 3 501st Clone Troopers, the Clone Pilot, and Anakin/Vader, $25 was a stellar deal, $27 wasn't bad (our Kmart charged $27.49 and it wasn't a sale, the store just charged 10% more on everything across the board). But $30? Well, it could be worse given the $7-per-figure prices of today's figures. If you see this set, you should probably consider getting one, be it for the figures or for the nifty window box packaging. Collector's Notes: This wasn't a figure that sold so well. It didn't do poorly, but the sad fact is that a lot of people aren't all that excited about an old man who sees no action and has no accessories. Oh, and can't interact with ships really. 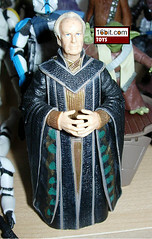 This is the ideal Palpatine for your Clone Wars shelf (as that's where mine lives), so get one. 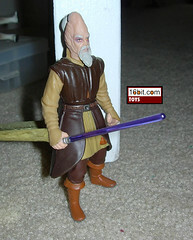 Oh, an abandoned concept for this figure was to include a holographic Count Dooku figure, which was significantly different than the ones sold in 2006. Here's hoping Hasbro considers releasing that as a bonus item some day! 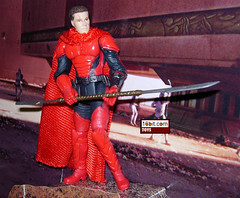 Collector's Notes: Many fans have noted that this figure is heavily inspired by abandoned concepts. It looks a little like some of the concept art for the Emperor's Royal Guards from Return of the Jedi. 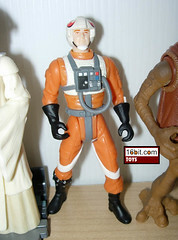 A design very similar to this one was proposed for a character named "Atha Prime" for the 1986 line of Kenner Star Wars toys. While not dirt cheap, the figure can be had for a fair price on the secondary market and it's cool enough that fans of good non-movie designs would be well-served to track it down. Commentary: Before you say Ki-Adi-Mundi has the wrong colored lightsaber, let me say both that you're right and you're wrong. Before Episode II, for some reason Lucasfilm Licensing allowed Jedi Masters and Knights to have a whole rainbow of lightsaber colors, as seen in the comics and video games. Plo Koon had a yellowish green weapon, Saesee Tiin also had a purple one, and even Mace Windu's was blue. Ki-Adi-Mundi and his purple lightsaber debuted in 1998 in the Star Wars ongoing series (which eventually was renamed Star Wars: Republic) so in the context of Episode I and its merchandising, this is totally 100% correct. Like many other oddities in the mythos and its licensed stories, George Lucas changed his mind and this altered a few other tidbits as time went on. The figure itself is on the lower grades of what was available at the time. 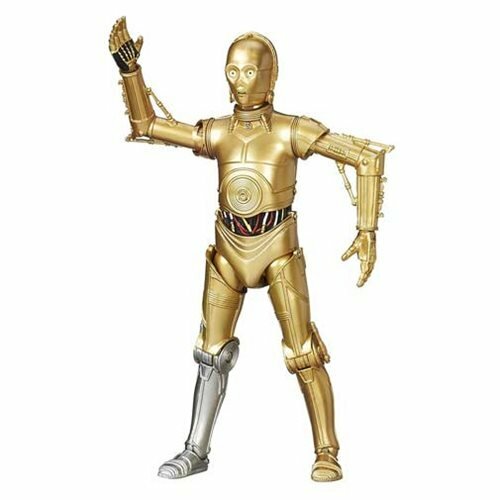 A large number of Episode I Jedi Knights had articulated wrists, elbows, and other "new"-to-us joints which really made the then-new figure line sizzle. Unfortunately Ki-Adi-Mundi was given but six joints, making him not so much a step forward as he was simply more of the same. The deco was good, the paint typically turned out nicely, and the figure aged well-- there wasn't a lot of "paint molting" problems, stability problems, or other annoyances of time. Ki-Adi-Mundi hasn't really had any bad figures, and since this one ties in more to the Expanded Universe than the films, collectors may wish to track it down. Collector's Notes: In 2002, a revised Ki-Adi-Mundi was sold using this mold and a retooled arm with a magnet and added articulation, as well as the now "corrected" blue lightsaber. 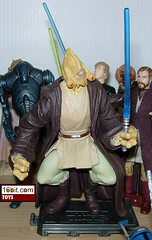 In 2005, an all-new super-poseable version of the Jedi was released for Revenge of the Sith. In between, a Jedi High Council version was produced which was, well, OK. Image: Adam's Clone Wars shelves. The snap-on armor is where the real problems start, because if you look at the show or Gentle Giant's statue, you can see that the figure is supposed to be basically just a regular Clone Trooper with some Jedi robes and a removable helmet. That's it. 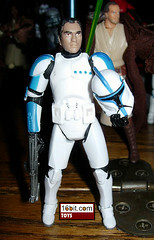 All Hasbro had to do to make it perfect was to take the 2003 Clone Trooper, retool the torso, slap on a new head, sculpt a removable helmet, and the figure would be perfect and hold together well. As Hasbro did design this for kids first, the play feature of snap-on armor was more important and as such, didn't please collectors. And as someone who opens these, I didn't much care for it because it looks sloppy and you can't get the armor to stay on, that and the sculpt of the helmet wasn't so hot either. Also annoying: the lance's plastic is so bendy that I don't think I've seen one out of its box that can remain straight. It's just so poorly made you may as well forget it came in this set, because, well, you'll probably toss it in a box somewhere. In short: as of today, this is the best armored Obi-Wan you can get. However, I'm holding out hope Hasbro revisits this with an armored Obi-Wan that holds together well and maybe even throws in a Speeder Bike with a less bendy lance for good measure. I know I'm not the only person who'd buy one or two or three. Collector's Notes: Sometimes the ideas work and sometimes they don't. This box set is an excellent value because you get 5 figures, one of which is excellent, two you likely have, and two that are just OK at best. There are no known plans for a rerelease or new versions as of today, but with the upcoming Clone Wars TV show I fully expect the concept to be revisited and hopefully actually work a little bit better. I'd rather be sold two separate figures than one that doesn't really do a good job of either mode, which is really how this one turned out. * - Yes, I know it's wrong, that's what the box said. Collector's Notes: It's notable to say that there are multiple members of this species in the films, and this one is a Rebel version. 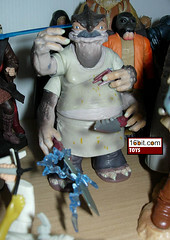 A Jabba's Palace-specific costume exists as a tiny Galoob figure but Hasbro has yet to revisit the species as an action figure, despite its reputation as being somewhat rare. (It's not really-- it's quite cheap on the secondary market.) 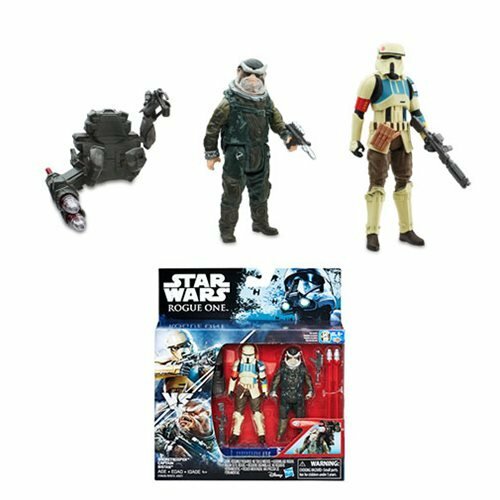 The figure was released alongside the very first Darth Vader with Removable helmet (at 4 per case), Captain Piett (2 per case), Zuckuss (2 per case), and of course 2 Ishi Tibs per case as well as some retreads. This is a figure worth owning, but it's going to be more famous for its being hard to find rather than its being excellent for its time. Commentary: In early 2005, fans received quite the assortment of action figures from Hasbro-- some of which were hard to get, and there were only eight new sculpts to be had. One of three new Cantina aliens was the first-ever action figure of Myo, a cyclops-esque alien we all first met in 1977. The figure is stunning. It has that "vintage" pose we all love-- basically standing at attention-- and is loaded with articulation. The figure featured ball joints at the neck and knees with normal joints at the wrists, elbows, shoulders, hips, and waist. In short, it's just barely perfect-- ball elbows and/or shoulders would have made this one of the best figures Hasbro has ever done. The sculpt is exquisite, the detail in the hands and costume simply shames most of Hasbro's other offerings, especially those based on this particular film. I'd daresay that the figure might be more detailed than the costume used in the film. It's hard to coax a lot of personality out of a figure with a very basic pose and a hard rubber face, but the figure does have a certain sense of mystery about it, unfortunately with but one eye you really can't exploit his eyebrows to get a lot of personality out of him. The figure provides a great base for custom figures (or so it seems), it's a great addition to any alien-filled diorama, and frankly, it's one of Hasbro's best figures. If you don't have one, go get one-- there's no excuse. Collector's Notes: The figure was a pegwarmer in some markets, and super-rare in others. It's currently one of the harder-to-get Cantina aliens as it has not yet been reissued, but Hasbro seems pretty big on making sure to kill the secondary market for these things. (A mixed blessing depending on who you are.) As it's unlikely that this figure can be improved upon, you best buy one now. This figure makes the previous decade's alien figures look like garbage. Currently, it goes for a fair amount and will probably cost you $10 before shipping. 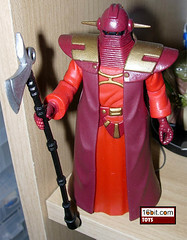 If you found the 2006 Garindan, Hem Dazon, or Greedo figures to your liking then you simply must snag Myo, Feltipern Trevagg, and if you have money left over, Dannik Jerriko. Image: Adam's TV tray. I actually took this around the first week of the column and just never wrote it up. Commentary: While I was initially thrilled when I heard Chi Eekway was coming out in a nifty exclusive box set, most collectors seem to disagree with me that this was a good thing. Sure, the figure has limited articulation and little in the way of accessories, but she may well be the first non-half-naked Twi'lek female, which is surely a dubious distinction but a distinction either way. If you like the picture, that's what it's like to own the toy-- she can't really sit, but she has excellent deco, a good sculpt, and managed to make the exclusive set not feel like a rip-off. I don't ask for much, just give me something I can call "new" without laughing. For augmenting your displays, this is a must-own figure. For those looking for cool aliens, don't pass this one up. If you're on a budget, though, you can probably live with waiting on this one a while longer. Collector's Notes: This item was expensive, but more or less worth it-- $35 for 4 figures with 3 new sculpts is up there, especially for "collectors" who bought Zett Jukassa in 2005, but at least there are some interesting figures here to make it a little less painful. So far, it seems the item hasn't been a spectacular seller, and you can get it in a bundle with the Republic Commando set on the cheap-- and it isn't a bad deal. The set is worth it if you're a fan of the prequels and like figures with a good back story. Collector's Notes: This item was released as part of the 30th Anniversary Collection, which came out several months early. The AT-RT Driver came in a four-pack with ROTS Yoda, Evolutions Episode III Anakin Skywalker, and a ROTS Mace Windu. Given that the AT-RT Driver, Mace Windu, and Yoda each cost about $5.25 in 2005, this set amounts to "highway robbery." 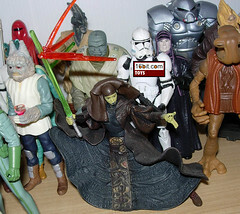 If you somehow got through 2006 without purchasing and re-purchasing the Mace Windu and Yoda figures a few times over, it's a neat set and the AT-RT Driver itself is very cool... but the only other "new" item in the set beyond the tin is the fact that this Yoda wears the Vintage Original Trilogy Collection robes. But if you have the chance to just get this one figure, you should-- it's worth it. 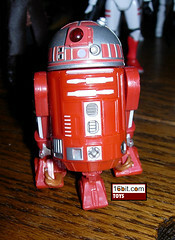 Commentary: When first rumored, the Star Tours line was said to be a bunch of R2-D2 and C-3PO repaints and Captain Rex. 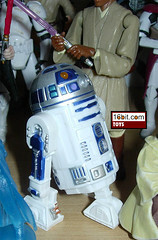 What we got was a little more diverse, as seen with R3-D3 which was part of the first series of these figures. The figure was a revised version of the very nicely designed R2-D2 from Power of the Jedi with a retooled head and, of course, new paint. The figure is jointed at the "shoulders" and "neck," and that's it-- he also has wheels. His coloring is actually fairly incorrect compared to the model used on the ride, which didn't have the red paint on the eye and, well, there's more wrong too. Basically, this figure isn't what you would call authentic, just neat. For those looking to add yet another astromech droid to their collection, this is a good one. It's also unique in that it's the only clear-domed droid to use this body, at least so far. Collector's Notes: While initially somewhat hard to get as a theme park exclusive, interest has cooled significantly in recent years. (Which is a little surprising given how hard these were to get if you didn't have someone who could do you a favor.) A number of Star Tours figures got closed out and appeared by the case on eBay for very cheap, and as such, the going rate of these little guys is about $10 or less-- so $10 plus shipping is about as high as you should go. Due to the figure's lack of accessories, articulation, etc., you might be left feeling $10 is too high. And it is. But it's not like you can buy one at Wal-Mart. Image: Adam's toy shelves. Again. Commentary: It's basically a statue. 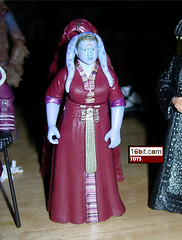 Luminara Unduli came out alongside some nifty figures when Episode II hit, some of which had significant articulation. Luminara is basically just articulated at the arms-- she has a few other points of articulation but it really doesn't help her much. This figure's extreme pose makes her look significantly shorter than she is, but she has a very striking stance and as a 3 3/4-inch Unleashed figure, she would be very cool. Her deco is good, her sculpt isn't bad, but the figure was outclassed in 2005 with a Revenge of the Sith figure. What you see is basically what you get-- she makes a wonderful statue at a great price. As a toy, she's horrible. That's really all you need to know. Commentary: The figure's construction may not be immediately obvious, but it's 100% recycled Clone. 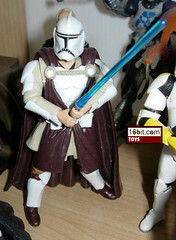 The body of the figure is the Revenge of the Sith #41 Super-Articlated Clone Trooper. 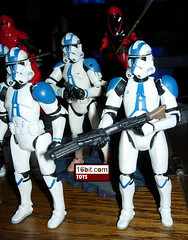 (The mold has since been re-used for others such as the Covert Ops Clone Trooper, Shock Trooper, and Utapau Clone Trooper.) 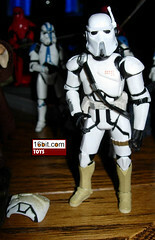 The shoulder armor belongs to Commander Bacara, and was also used for a "lunchtime special" black market Clone Trooper that was frequently seen shipping out of China on eBay last year. The figure's decoration is actually quite snazzy, just like Mace's starfighter-- there's two tones of purple coloring. If you look at the "U" on the belt, you can see a metallic shine to the color. This metallic paint is also used on the helmet in places, and on the shoulder armor. (It looks amazingly good on the shoulder.) 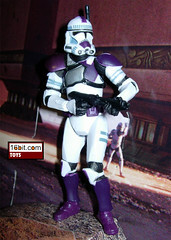 While some have said that the figure is just a Shock Trooper with purple markings, this is not correct-- some added deco points are on the figure, and some of the markings are grey, and not purple. So it's a little more ornate, but still, the figure is basically what you would expect-- mostly. Collector's Notes: The Episode II and Episode III hammock is largely called Clone Wars, so it makes sense that any Clone Trooper with the Revenge of the Sith helmet design and any relation to a character killed in that film would be, by default, Clone Wars. As far as I can tell, no fiction has shown a visual representation (or even a mention) of Mace having his on squad-- but hey, here it is. The box says "As Seen on Cartoon Network" but does not sport a Clone Wars logo like on other recent items from the series. 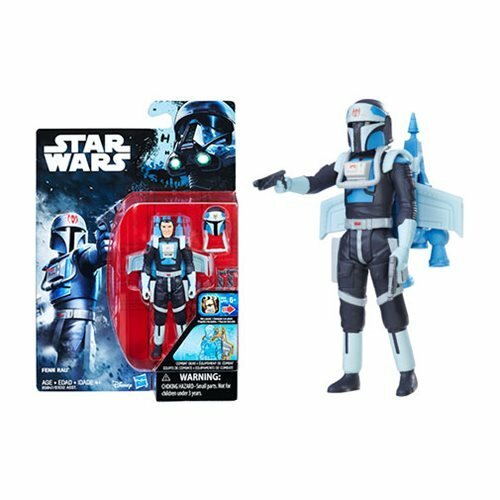 Which is funny, because it would make more sense to say that this is a toy from the Clone Wars because it could be, yet I do not recall seeing it on Cartoon Network at all. Also, this set includes three of the Clone Trooper I just profiled, one Clone Commander, and Mace Windu in the boxed set. Collector's Notes: Who knew this is pretty much where Hasbro would draw the line? 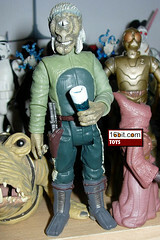 After Ody, a carded Sebulba would follow in Power of the Jedi. And then there was Teemto Pagalies in 2002... and then you don't see much for a while. The bulk of Episode I product is now dirt cheap, so if you want one, it's not going to cost you a lot.